"A tradition of Indian Tokri giving still lives on"
What a better way to show your joy, when presenting your friends or relatives with a tokri brimming with sumptuous delights. Decorated Gift Tokri with approx. 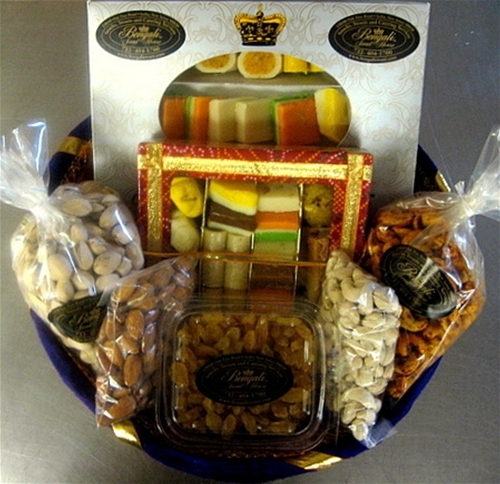 7.00 lb of Assorted Premium Dry Fruits and sweets wrapped with a decorated ribbon. Fresh sweets and dry fruits shipped directly from our kitchen. All Gift items are professionally packed and a personal message can be included with each gift tokri if desired. The basket is a Typical Indian hand crafted design inside-out with a silky fabric. It is uniquely crafted just for Bengali Sweet House . Please allow additional one day for this item to be shipped.